Who knew that FOOD could make such a difference? Ironically, it was in 2004 when I started to gain a little weight that I was led to what I now call my “food conversion”, and all because a friend introduced me to the Weston Price Foundation. 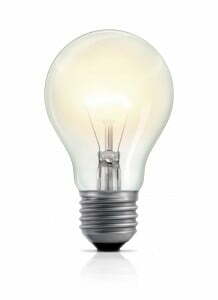 I clicked onto the WAPF website and as I started reading, a bunch of light bulbs in my brain clicked on, too. I found out that we had all been DUPED. Butter is actually GOOD for us, and so is meat, as long as it's raised in traditional ways! I also learned that food is powerful. It can make us sick and miserable, or it can nourish us and give us energy and vitality. Going back to real foods like butter was easy, and everything tastes better that way anyway. Other changes weren't as simple. There were many food flops and some complaining, but I eventually figured it out. I can now take our family favorite recipes and adapt them into much better-for-you versions, and they're better tasting now, with so many fresh, healthy ingredients that are good for us, too! I also now know where to find the best foods. It was difficult for many years, but thankfully, sourcing real food from the farm or finding organic foods from the grocery store is getting a little easier, as long as you know what to look for. I want to help you get on top of this much more quickly than I did! Find out which ingredients are best and which to avoid. —> No more wondering if the groceries you buy are worth the cost or even safe. Know which fats we should be using and and in which recipes. —> You'll be able to avoid the bad-for-you fats, instead of unintentionally making yourself or our loved ones sick, and definitely more prone to obesity and chronic disease! —> So you'll know how to keep such nutrient-poor “food” out of your grocery cart! —> You'll stop spending extra money when it's not necessary. —> So you won't get duped — you'll know the truth and can choose wisely. —> This will be simple, clear, and easy to incorporate into your life. If you've thought of switching to more nutrient-dense, fresh milk, find out what *exactly* you should look for in a raw milk farm. Do you wonder what's the big deal with fish oils? You'll be able to tell which brands are the better, safer choice. —> You'll stop wasting your money on junk that won't have much benefit and could even be harmful. —> You'll have the help you need to stay motivated, to deal with family complaints, to find the time to implement these new ideas, and to afford this lifestyle as well. Being overwhelmed can paralyze you into doing nothing. —> The simple explanations in this book will keep you moving forward on the journey so you're not stuck in uncertainty and confusion, and so you can make a real, lasting difference in your family's health. Want to get your whole family onto real food and finally nourish them back to good health, or KEEP them healthy? Real Food for Rookies can help you track down real food at your local supermarket or farmer’s market. If you're sick of the struggle I can help! I've been there. I have four picky kids, a limited budget, and a busy life, too, but I can show you that this is DOABLE. You can see around you that too many are sick, depressed, and overwhelmed, but that doesn't have to be your family. Not anymore! I'm excited to come alongside you and be that friend who won't judge (we're not perfect here either), instead I can help you know what to buy and why, where to buy it, and how to afford it. This book has everything you need in one place! I just ordered 10 copies of your book — suddenly I'm having friends and acquaintances asking, “Where do I start?” It's the perfect tool for me – not to get into their space too much yet hand them something meaningful. It's less than taking them out to lunch. Seriously, what a deal. So, THANKS! Kelly the Kitchen Kop has patrolled the food aisles and the internet and come up with a streamlined food guide for staying out of trouble. Confused about nutrition? Kelly sets the record straight with this practical, easy-to-understand compendium of food sources and sound advice. Transitioning away from the highly-industrialized fake food environment we live in to one that is comprised mostly of healthy real whole foods is intimidating to a whole lot of people. How do you cut through the marketing claims and get to the very heart of what really matters when it comes to eating real foods that will nourish your body on your way to attaining optimal health? That's exactly what Kelly The Kitchen Kop has done with this book, arming you with exactly what ingredients you want to be looking for and which to avoid in making the best choices for food. It's a nutritional wasteland out there, but the good news is Kelly is throwing you a lifeline. Grab it, hold on tight, and get lifted out of the grips of the modern food culture sooner rather than later! Blogger, author of Cholesterol Clarity: What The HDL Is Wrong With My Numbers? Kelly the Kitchen Kop's Real Food for Rookies is a simple, practical tool for navigating that modern day minefield otherwise known as the supermarket! Whether you are just learning to eliminate the junk food in your home or have been seeking healthier alternatives via local producers for some time, Real Food for Rookies will provide you tips and ideas to make sourcing and preparing healthy meals for your family an efficient and budget friendly experience. Real Food for Rookies also overviews some of the most damaging health myths out there today and why choosing food like Great-Grandma made is always the best policy. I've long been a fan of Kelly's work to promote back-to-basics real food through a simplified, gentle and practical approach. Real Food for Rookies provides simple, thoughtful guidelines for those transitioning to a traditional foods diet, and no-fuss recipes that even the pickiest family members will love: pizza, French fries, ice cream, but all created with nutrient-dense, whole foods. 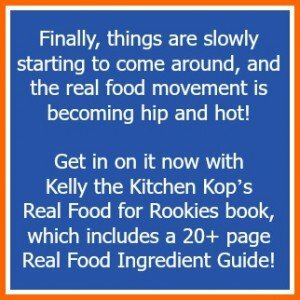 Kelly's Real Food for Rookies is one of the first resources I recommend to anyone who is new to real or traditional foods, or to anyone who simply wants to feed their families better without compromising on health, nutrition or flavor. Confused about real food? This guide will tell you all you need to know. Want to know what foods to avoid? It's here. Want to know what foods to eat? It's here. Want to know why real food is better? It's here. Want some great guidance on how to make the switch from factory food to real food? It's here. Superbly written and researched, easy to use and understand, this is the BEST guide to buying real food I have ever seen. Kelly's Real Food for Rookies gives you simple, easy to follow instructions for making lasting improvements to your diet and health. She helps you break through the quagmire of confusion about GMOs, processed foods, and making healthy choices. If you're making the transition to eating real food, you need this book. Kelly is a great friend to the local food movement and to consumers' right to access the foods and healthcare of their choice. Her blog generates demand for small farmers producing nutrient-dense food and advocates for them by sounding the alarm for support when there is a threat of government enforcement action. Real Food for Rookies is just one of a number of ways she promotes the health of families and communities through her work. For years, Kelly the Kitchen Kop has been my “go-to” source whenever I have questions about food. She is so knowledgeable and easy to understand. Real Food for Rookies is a must-have for anyone who desires to save money and adopt a real-food lifestyle. Finally real food is becoming popular, but you may feel like you're not getting anywhere and don't know what to buy, where to get it, and WHY does it matter?! In Real Food for Rookies, every obstacle is stomped out, so now you can find the help you need and get a handle on your shopping, cooking, and eating habits. You'll know how to avoid dangerous foods, and instead feed your family nourishment that will help them get well or stay that way. 5 *Real Food* Christmas Gift Ideas!